You probably have a Star Wars fan, or several, in your life — whether it’s your obsessed cousin who camped outside the movie theater for the midnight release of The Phantom Menace or your friend who plans on seeing The Force Awakens solely because of her crush on Adam Driver. Luckily, there's no shortage of Star Wars paraphernalia out there in the world, with varying degrees of practicality. Just in time for the long-awaited release of Star Wars: The Force Awakens , we partnered with COVERGIRL to round up the best in Star Wars paraphernalia for every level of fandom. This is an actual-size, true-to-life, lightsaber replica. How much more intense does it get than this? This is not for the novice fan who decided at the last second to go as Luke Skywalker for Halloween. Modeled after Kylo Ren's signature crossguard lightsaber from The Force Awakens, this is actually meant for destroying Jedi. Do you have a friend who attends Comic Con every year? Get her this. Incorporating BB-8 accessories into an outfit is pretty legit. Here's a foolproof gift for the DJ in your life, especially if you know one with an upcoming gig at the Mos Eisley Cantina. If anyone asks, I would like a pair, too. Rebel Alliance, please. With recipes like Greedo's Burritos and Obi-Wan Kebabs, this is the sort of gift you give when you're actually the big Star Wars fan, and your friend is just a big foodie (or vice versa). Now, do you like your cookies hard and crunchy, or soft and Chewie? Wow. Just...wow. Somewhere out there, there is someone willing to display a giant Jabba the Hutt inflatable on his or her front lawn year-round. I do not personally know this type of fan, but I sure hope you do. Bonus if they have a small dog that can pose next to it as Salacious B. Crumb. COVERGIRL is celebrating the release of The Force Awakens with their Star Wars collection, featuring items like a custom Limited Edition Super Sizer Mascara and super-glossy Lip Lava. These gift packs include both, and are perfect for beauty junkies and movie fans alike who want to channel their inner Intergalactic princess. Some people will love lounging in this robe because it's long, soft, hooded, and frankly just looks super-comfy. 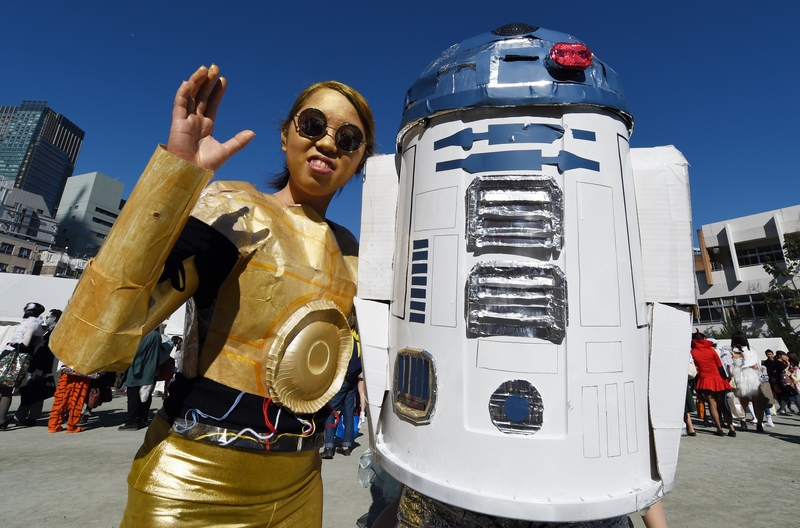 Other, more passionate fans may wear it and walk around all day waving their hand, saying matter-of-factly: "These aren't the droids you're looking for." Honestly, these necklaces are adorable even for those who don't know much about the Rebel Alliance or the greatest love story of our time, Leia and Han. This teapot is as fun as it is functional (much like the real R2-D2), but it takes a special kind of fan to really commit to a piece of Star Wars kitchenware out in plain sight. Help your quirky friend up her entertaining game. Sugar cookies shaped like the Millennium Falcon just taste better than boring circles, don't they? Assuming your intended gift recipient steps into her own bathroom regularly, she's going to be seeing quite a bit of this comic book-style shower curtain. So she should be fairly invested in the franchise.